We parked off James Canyon Drive (County Rd 94), next to Curie Spring. Starting our hike at 10:16, we walked about 1/10th mile east, down James Canyon Drive, then we turned left onto the beginning of the Castle Gulch forest road. A house sits right at the start of this road. After about 2/10ths of a mile on the Castle Gulch forest road, we turned off the road, at the first sharp bend, and started ascending the steep slope which is the southeast ridge of Golden Age Hill. Heading north, we reached Knob 1 (see point list below), where the odometer showed 0.58 miles. This is a large somewhat flat forested knob that gives the impression of not having been visited by man since the last miner left 100 years ago. From Knob 1, we headed west to a saddle on the ridge (point 2), getting there at 11:07, where the odometer showed 1.08 miles. This is where the southeast ridge meets the south ridge of Golden Age Hill. From the saddle we headed north, up the south ridge of Golden Age Hill, toward its summit (point 3). The entire ridge hike, from Knob 1 to the summit, is very rugged terrain. The ridge narrows to a few feet in places, and there are a few cliffs. The extremely high winds made the going even slower. From the south ridge, there is a nice view to the west of the cliffs on the south ridge of Porphyry Mountain. As we got closer to the Golden Age summit, we entered the burn area of the Overland Fire, and passed lots of dead, toasted, but still standing trees. We reached the summit of Golden Age Hill at 11:48, with the odometer showing 1.68 miles. The USGS marker on the Golden Age summit says 8400 feet, the GPS showed 8419 (accuracy 15 ft), while the topomap shows 8378. The summit has a register placed there by Mike Garratt on Jan 6, 2002. We found our old entry on this register, dated March 12, 2005. 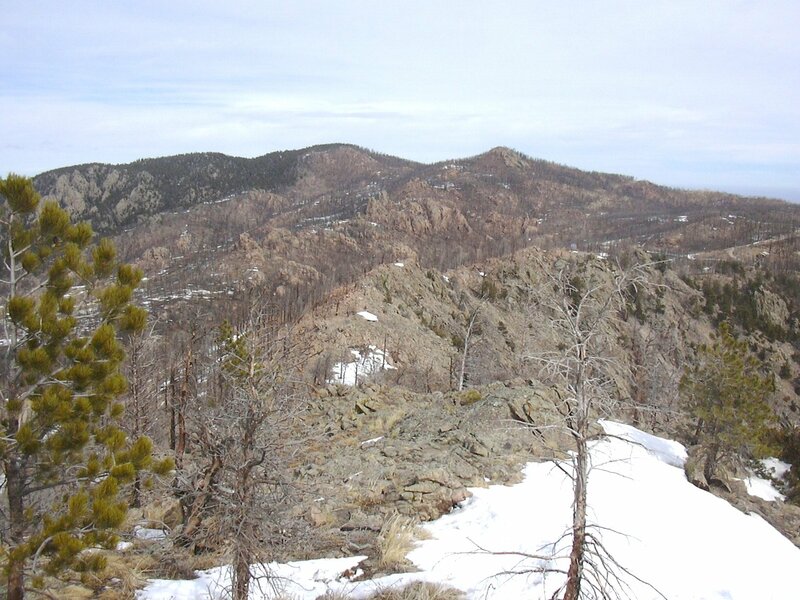 From the summit of Golden Age, you can see Porphyry Mountain (west), Bald Mountain (northwest), and Fairview Peak (northeast). But thanks to the forest fire, the landscape has the look of the aftermath of nuclear war. There is a stunted windbasted douglas fir which is still alive on the summit. From the summit we descended the northeast ridge of Golden Age toward a mine (point 4), then followed a road for awhile, heading northeast, before ascending Fairview Peak. An observation made along the way: Just below the summit of Golden Age, Stefan's boot turned over a small rock, and I noticed there were many little live ladybugs on its bottom surface. It was amazing to see those guys already moving in February, above 8000 feet. I put the rock gently back in its place to keep them snug. We reached the Fairview summit at 12:46, where the odometer showed 3.14 miles. We found a summit register. There were several entries from this year. Luke Plumely signed it on Jan 5, 2008. We didn't stay long on the summit since the wind was fierce. We retraced our steps back to the road which passes by the mine (point 4), then returned via Castle Gulch (points 6 and 7). 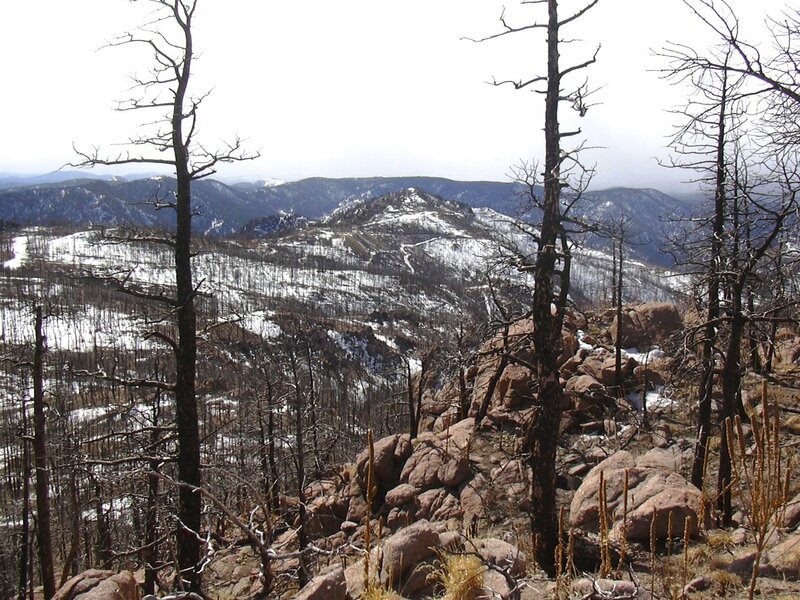 It's been over 4 years now since the Overland Fire of October 2003, and we couldn't help but notice that there are no seedlings of any trees in the burn area between Golden Age and Fairview. There are plenty of new plants though. The most conspicuous are the very tall skinny weeds called common mullein which we encountered almost every step of the way. We returned to our parking place at 14:48, where the odometer showed 6.49 miles. The total trip time was 4 hours, 32 minutes. The elevation gain from the parking place to the summit of Golden Age was 1806 feet, and then a gain of about 440 feet to the summit of Fairview, for a total of 2246 feet.